Today we’d like to introduce you to A. Laura Brody. I re-imagine wheelchairs, walkers, and mobility scooters as works of art. My interest in mobility devices came from dealing with a former boyfriend’s stroke. I was fascinated by wheelchairs, walkers, and any other devices that help people move and adapt. However, I couldn’t understand why their designs were so cold, clinical, and hideous. They were almost insultingly ugly. There had to be a better option! I am a professional costume maker and designer by trade. I didn’t have any medical equipment training but knew that I could create interesting designs. 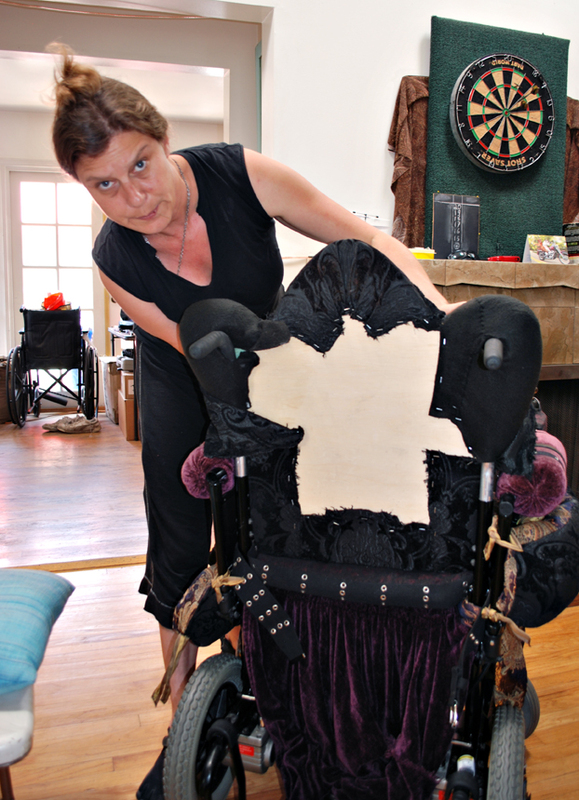 A good friend, Peter Soby, donated his unused electric wheelchair and I remade it into an Edwardian throne. This first piece was lovely, but the upholstery was so thick that Peter was practically pushed onto the floor the first time he used it. Fortunately, he was unhurt and good-humored! I learned quickly how much more there was to know about making functional wheelchairs but was still intrigued by the process and the idea. I decided to start with art, instead of the medical device manufacturer, since it’s a world I know more about. Art is also such a graceful way to introduce people to new concepts, and a wonderful way to start a conversation and help to change minds. While working on my first mobility artworks, I found out how few interesting designs for wheelchairs ever make it to market. I found that I was unintentionally touching on taboos about disability and mortality, and got some surprising resistance to the idea of making assistive technology beautiful. Luckily, instead of being discouraged, I got stubborn. 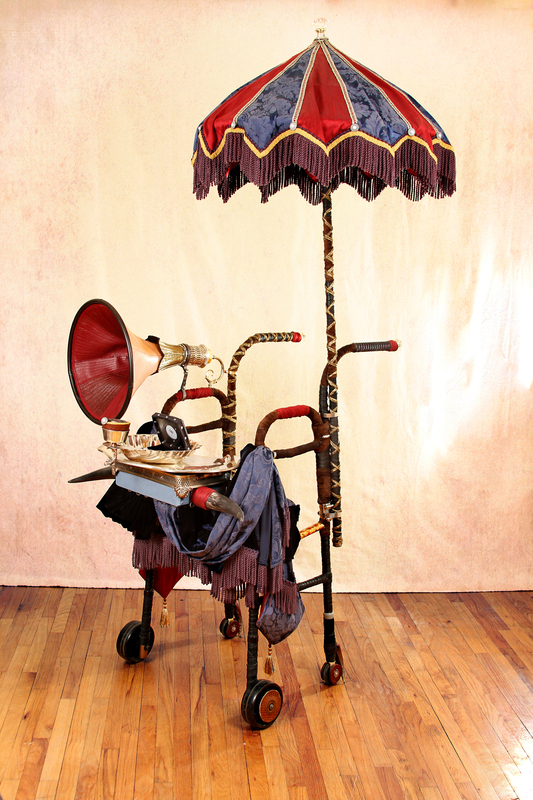 That stubbornness led to developing Opulent Mobility, a group exhibit that re-imagines disability, mobility, and access. Is creating something new ever a smooth road? The idea of decorating a vehicle or walking aid is not new, but there is a real resistance in our culture to looking at disability, injury, or the aging process as something beautiful. Of course, many people have been really supportive of Opulent Mobility and of my artwork. It’s not always the case, though. 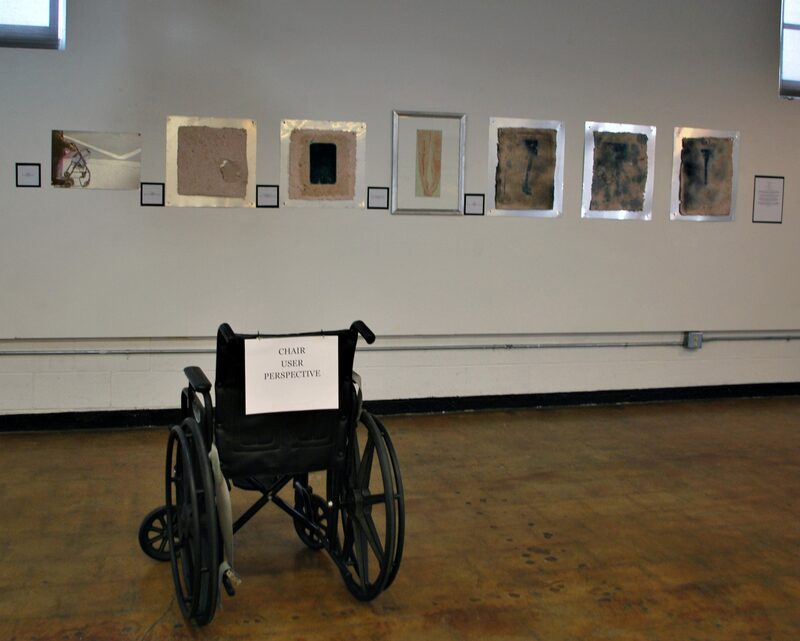 One of the biggest issues has been the lack of ADA compliant gallery space in Los Angeles. Most LA galleries are not accessible, and the ones that are come with a high price tag. Because of the nature and theme of Opulent Mobility, it really needs to be shown in an accessible space. Several of the artists in past exhibits identify as disabled, and so do some of our audience members. It is not cool to show the work in a space that can’t accommodate them, and it’s been a real challenge to find affordable spaces that do. Unfortunately, this issue is often overlooked, or access is not complete. Access for a whole section of the population is being cut off out of fear of insurance liability and financial concerns about renovation costs. The thing is, if we make spaces more accessible, it helps out more than wheelchair users. Strollers can move more easily, and so can people with crutches and other temporary physical issues. Better access can help us all. So let’s switch gears a bit and go into the Opulent Mobility story. Tell us more about the business. Most disability artwork dealing is about the artist’s individual struggle or social issues. Opulent Mobility takes a unique approach. 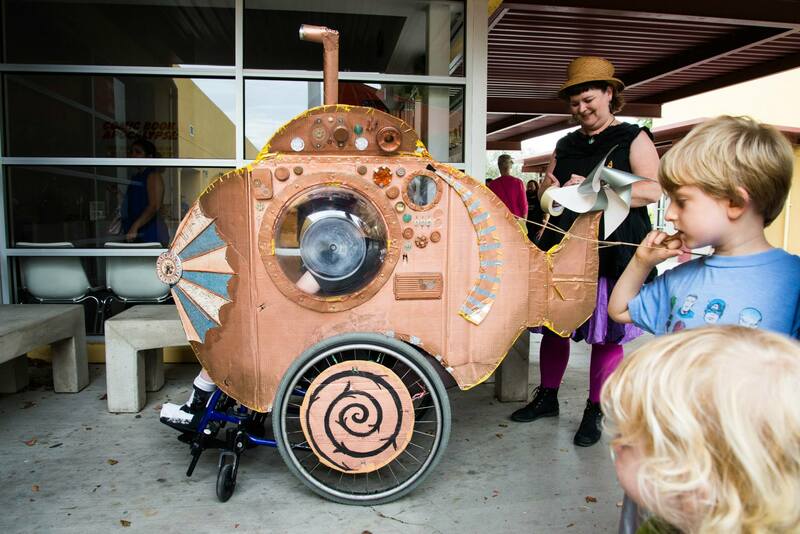 It’s a personal and collaborative way of using art to celebrate the possibilities of adaptive design and of disability. After creating my first mobility artworks, I asked other artists to join me and developed the first group call for art. 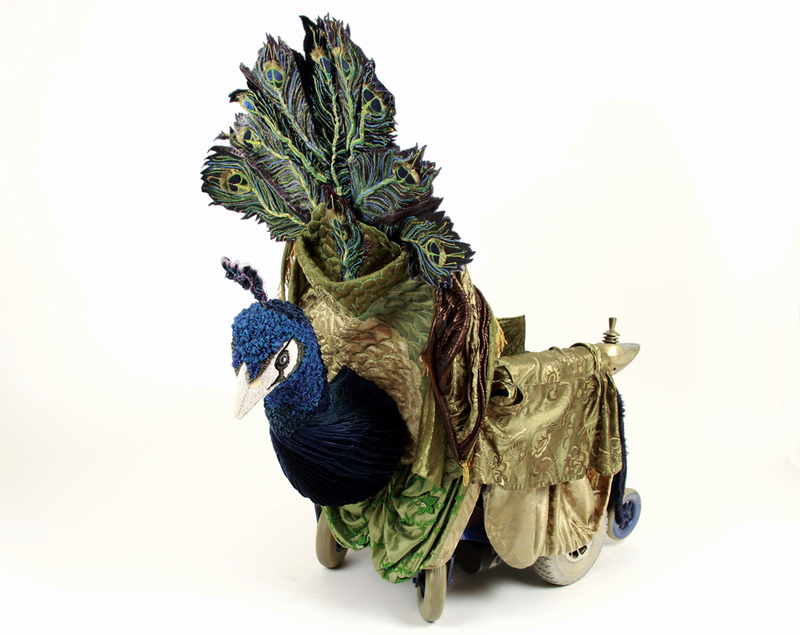 Opulent Mobility 2013 was held at the Bell Arts Factory in Ventura, with seven artists and maybe 100 viewers. The second exhibit in 2015 was co-curated by me, Anthony Tusler (a notable disability rights scholar and activist) and Zeina Baltagi. It took place at Cal State Northridge’s West Gallery and featured artists from all over the world, with a reach of about 1000. Opulent Mobility 2017 was an online exhibit with a global audience of over 2000. We are growing bit by bit and spreading the word. In the fall of 2018, Opulent Mobility is expanding to both a physical and an online exhibit. I’m seeking out funding, artists, and an ADA complaint gallery space. 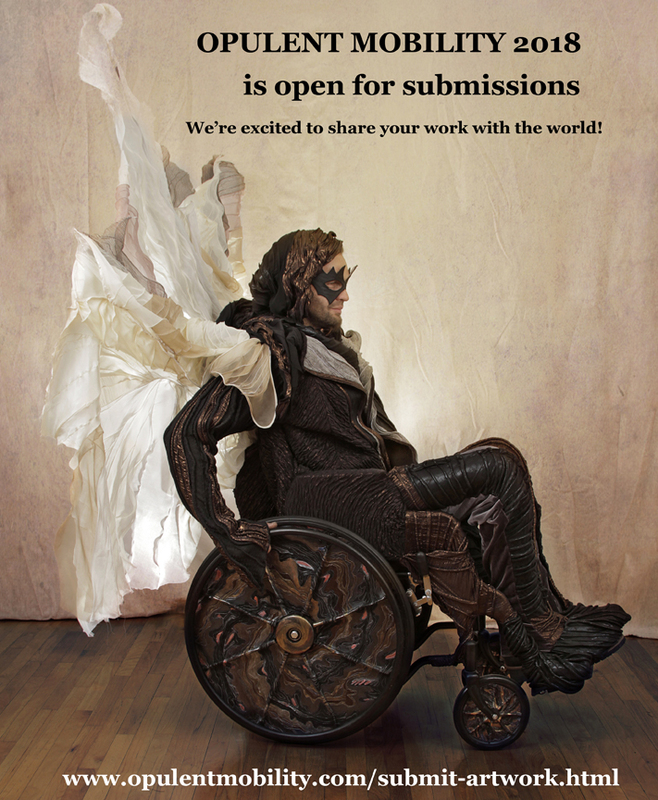 If you are an artist who re-imagines disability, mobility, and access, please submit your work! The deadline is July 31. Galleries with accessible spaces, I would love to hear from you. And Opulent Mobility’s sponsorship through Fractured Atlas means that any donations to support the exhibit will be tax deductible. Of course, I’ve worked very hard to make Opulent Mobility possible, but luck has definitely played its part. The first exhibit nearly didn’t happen. It took nearly a year of calling and “dropping by” to set things up. When I finally met with the person running the space, we were able to communicate after talking about his experiences with his dad, a wheelchair, and a way too steep wheelchair ramp. That piece of luck opened the door. I found my co-curator Anthony Tusler because he applied late to the first call for art. He has helped smooth the way with some big voices in the disability arts crowd and encouraged me to talk about Opulent Mobility at UCLA’s Disability as Spectacle Convention and at the DisArt Symposium. Zeina Baltagi came in for the first show and introduced me to the gallery head at CSUN, which made the second exhibit possible. Teri Grossman of Audio Eyes approached me out of the blue about audio descriptions for the 2015 exhibit, and she did a great job on last year’s exhibit. I was also lucky enough to have my good friends Mari Weiss, McKerrin Kelly, and Gia Mora offers their help: they are accomplished voice-over artists who recorded the audio descriptions for the online versions of the 2105 and 2017 exhibits. There are so many more people I’ve met through this process who have helped make Opulent Mobility possible. I am grateful for their help and encouragement, especially when luck doesn’t go my way. Submission fee for Opulent Mobility 2018 is a flat $20.